New dance, talks & information, debate & mingle for all dance interested. 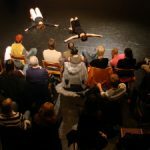 The Association Swedish Choreographers (Föreningen Svenska Koreografer, FSK) starts the project Under Mark, a place where dancers and choreographers, established and well as non established, can show their ideas and receive feedback on their work. The first evening is here at Weld.